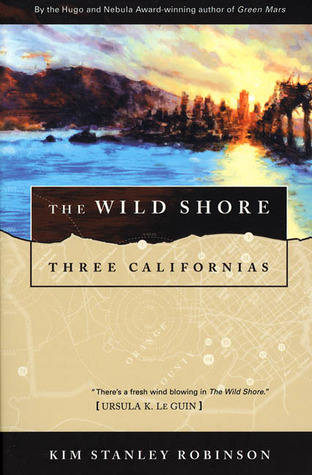 It’s been a while since I’ve written a review, but The Wild Shore by Kim Stanley Robinson is one of the best books I’ve read in years. Fantastic story, compelling characters, interesting issues, vivid writing – I just loved it. It is set in America “after the bombing”. The United States is no more. America has suffered a severe nuclear attack. Millions died in the initial attack, and millions more in the aftermath, struggling to survive in the new pre-industrial world. Getting food by growing and hunting it, avoiding the “scavengers” – the people who live from the looted ruins and hunt one another. What is more, the outside world is actively preventing any kind of reconstruction, using their space age technology to destroy any attempts to build up an industrialised civilisation. About sixty years after the bombing seventeen year old Henry is living in a coastal farming community. He has a rather strange view of history, learnt from old Tom, one of the only people who still remember the “old times” before the bombs. This is a combination of truth and tall tales, and in fact, this is a strong theme in the book – the importance of story telling and the need for “lies”. Henry has to make some hard choices when he meets outsiders urging him to join the “resistance”, a group people who vow to fight the outside worlds attempts to “keep America down”. He learns about betrayal and regret, and what it means to be an adult in a harsh world. The setting of this story is just awesome. Trees growing on the abandoned highways, crumbling sky-scrapers, flooded cities. Kim Stanley Robinson always loves to dwell on the detail, and its never just “description”. The landscape is as important to the plot as the action. And apparently there are more – a whole series of “Orange County” books. Off to the library to find some more!